La Trobe University Media Hub gives students a significant career advantage. The La Trobe University Media Hub was officially launched on Thursday 7 September, 2017. The launch comes as the university celebrates its 50th year. 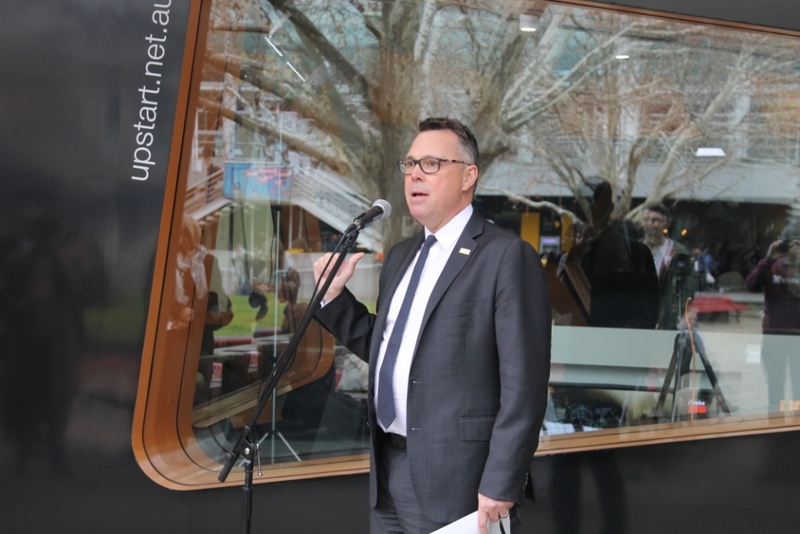 La Trobe’s Vice Chancellor, Professor John Dewar, called the opening a “fantastic day”. “La Trobe built its first film and TV studios in 1975 … It really laid the platform for La Trobe to become one of the country’s leading universities in media and communications,” Dewar said. “This facility will give our students the edge in developing skills in the modern media environment and help them lay the platform for wonderful careers in media over the coming years. “I’m really looking forward to seeing all the various forms of media output that will now be enabled by this new facility. I think it’s a great example of how the university is modernising its approach to teaching and learning,” Dewar said. Professor Tanya Fitzgerald, Head of the School of Humanities and Social Sciences, who also spoke at the launch, discussed the opportunities the Hub will provide to students. “This broadcast facility very much allows our students to learn and enhance their skills using media and studio equipment for live broadcast as well as the development of our online magazine and news,” she said. The Hub has become an integral part of La Trobe Live and upstart activities, with both groups now operating from the building. Bill Bainbridge, who has been running the Live Team during Semester 2, told upstart that the facility was very much like a real TV studio. “There are some technical differences but the practice of presenting … of switching video, of using audio, of playing packages is very much like they would do in the professional world,” he said. “I think it adds something to the whole campus because it’s in the Agora and the Agora is such a good facility … it’s such a drawing point for everybody at the university. It really makes what they’re doing public and it adds to the vibrancy of the whole university. “It just makes it an exciting, interesting place to be even if you’re not directly involved in it I think you can draw something from it,” he said. Emel Berdilek, a Graduate Technical Officer responsible for the smooth running of the Media Hub, told upstart how beneficial the new space is for all involved. “Our new facility benefits students involved with La Trobe Live in providing practical experience, helping them learn new skills from working in a Live studio environment,” she said. La Trobe Live was a major part of the celebration, with all three weekly shows switching up their schedules to air special episodes on the day. The Recovery and The 10 Express aired prior to the official ceremony with The Eagle Report following up with a special event featuring an interview with the Vice Chancellor. The event also featured free popcorn, a live stream on the big screen and studio tours. La Trobe Live streams on the upstart home page on Mondays and Wednesdays. Interested students are encouraged to contact the university to find out what opportunities are available in the new Media Hub. Jessica Jones is currently completing her third year of a Bachelor of Media and Communications, Journalism Major.